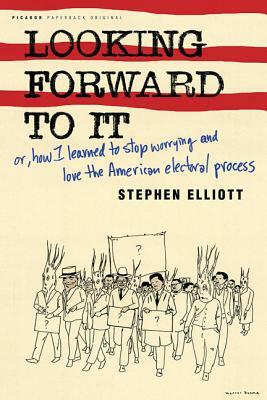 Stephen Elliott does not know what to think of American voters, this year's desperate and heated run for presidency, or the legitimacy of the political system. He doesn't know whether to love John Kerry or try to love Howard Dean or try, simply, to get excited about Politics. But what he does know is that most Americans are as confused, taxed and broken-hearted as he is. Looking Forward To It is the chronicle of one ordinary fellow's skeptical -- and hilarious -- journey through the election process. It is on the campaign trail that he will meet washed-out campaign managers, idealistic publicists, corrupt journalists, world-weary auditorium janitors, recovering drug addicts, and, of course, politicians. His report documents a journey into the center of "the thing", our country, where Americans high and low come together to participate in the most profound gesture of democracy: the election.